From a masquerade ball sangeet to a 1920s-inspired retro reception, Satpreet and Karishma's grand nuptials at Dubai's Madinat Jumeirah were high on creativity and fun. 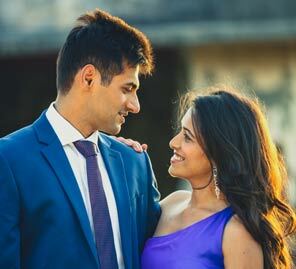 Their wedding celebrations unfolded in the lavish environs of the Madinat Jumeirah resort in the heart of Dubai and was resplendent with warm Arabic hospitality, scenic environs and picture-perfect decor. Here, brideKarishma shares highlights of the celebrations. "We hosted our nuptials at the Madinat Jumeirah Resort. The sprawling venue, luxurious decor and excellent hospitality made it our number one choice for all the functions that were going to have a big guest list. A recreation of ancient Arabia, the resort’s plush decor was the ideal match for our grandiose ceremonies. The beautiful venue was brought to life by the vivid colours and spectacular decor of the wedding." "The celebrations kicked off with the mehndi ceremony that was intimate yet high-spirited. Since the gathering for this event was not a large one, we hosted it at our family villa where our close ones reveled in the merriment and boogied away till late in the night." "The sangeet took place at Jumeirah Mina A’Salam, which is a boutique hotel inside the Madinat Jumeirah Resort. The theme for this function was reminiscent of majestic and mysterious masquerade balls. The colossal masquerade backdrop was matched with ethnic decor elements, and performances by friends and family truly set the stage on fire. The energy at our sangeet was infectious and it was hard to spot a single person who wasn’t shaking a leg." "Our wedding venue was decorated in yellow and white. Satpreet’s 'baraat' (groom's procession) started from Al Qasr, another standout hotel at Madinat Jumeirah, while I arrived in an 'abra' (traditional Arabic boat) along the canal that winds through the resort. When I got off the abra, a thousand balloons were released to signal my arrival. It was magical and I felt like a princess. 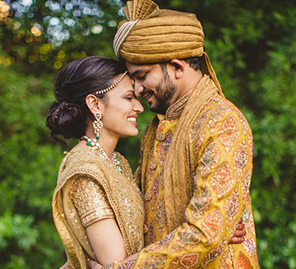 Satpreet wore a bronze sherwani for the wedding ceremony which paired well with my yellow ensemble." "The theme for our reception was inspired by 'The Great Gatsby' and the decor included props like a vintage typewriter for guests to type in their wishes to us and a massive Gatsby photo-booth. Some even wore flapper dresses and headbands to keep the spirit of New York in 1920s alive. DJ Sash kept the guests dancing to some groovy numbers and remix songs."